A 16 foot log gazebo with an adjoining 20 x 30 foot arbored area provides a comfortable shaded area for your guests. The facility includes an air conditioned indoor area with a full kitchen, a reception area for buffet food service, a guest bathroom, and two suites: one for the bride and her bride’s maids and the other for the groom and his groom’s men, each with full private bathrooms. French doors create a 6 foot opening accessing the covered deck that accommodates the upper dining area. Walk down the wide stairway and your standing on a 10 X 12 landing under a beautiful wisteria arbor. A couple of more steps down and you’re on the cobblestone patio. This area provides an additional dining area for round tables with market umbrellas. An open log structure at the north end of the cobblestone area provides a bar/beverage area with power, water and refrigeration. 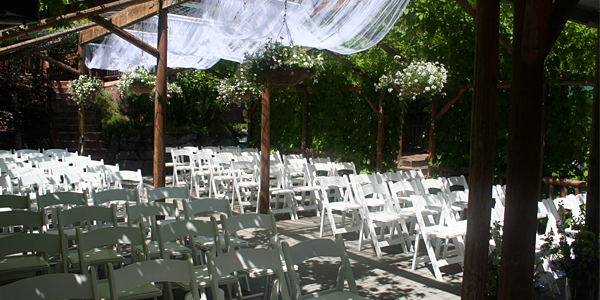 A 16 foot log gazebo with an adjoining 20′ X 30′ seating area provides the ideal location for the ceremony. Beyond the ceremony area the lodge offers many beautiful areas ideal for natural outdoor photographs.